Long ago in Egypt, the wise man Noah had a prophetic dream. The god Yaweh showed him that the world was full of wickedness, and instructed Noah, the only righteous man left, to build an ark and save all the animals. Yaweh would send a great flood to wash the earth clean, and Noah was to repopulate the land when the waters receded. Noah was going to bring all his family with him, but he found out that his son, Bith, and Bith’s son Ladra, had been part of a gang of thieves, along with another young man named Fintan. Noah told Bith he was not welcome aboard the ark! Bith went to his daughter, Cesaire, who was busy building an ark of her own. Cesaire had her own god, and had decided that she was going to try and get around this flood by sailing west to an unpopulated land. She reasoned that maybe Yaweh wouldn’t send his flood to a land that hadn’t had any sin committed on it. Cesaire agreed to take Bith, Ladra and Fintan with her, as long as they agreed to forsake the god of Noah, and follow all of her commands. Cesaire built her ark, and started to gather followers. Three times fifty women, with all sorts of skills and knowledge, all that they’d need to make their way in the new land. came to her. So many, that Cesaire had to build three arks to carry them all. Her brother Ladra was a pilot, and made himself useful to her. And Cesaire fell in love with Fintan Mac Bochra and married him. Cesaire and her followers set sail. They sailed for seven years, crossing all over the known world, from the Nile all the way to Asia Minor and the Caspian Sea, across the Mediterranean. They sailed up rivers as far as the Alps, and lost two of their three ships along the way. At last, from a tower in northern Spain, Cesaire saw the coast of Ireland in the distance and knew their journey was nearly at an end. They landed in Ireland, in the harbour of Corca Dhuibhne in Kerry. 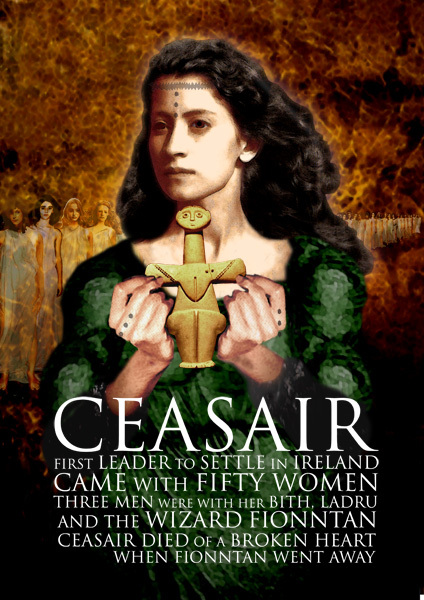 Cesaire jumped onto the land first, because she was the leader, and so she became the first person ever to set foot on Ireland. Fintan Mac Bochra was the first man. All the others landed safely, except Ladra the pilot who took a wound from an oar to his thigh. They lived happily together for a while, but unfortunately Bith son of Noah was unable to cope with the task he’d been given and he died – the first death in Ireland – so his 16 women were divided between the other two men. Now Ladra had never quite recovered from the wound he’d taken when they landed, and he quickly succumbed. Now all the women looked to Fintan to populate Ireland. Poor Fintan, being just one man among fifty women, was completely overwhelmed by this task and ran away and hid in the mountains. Cesaire, deeply in love with him, died of a broken heart. Fintan hid himself away in a cave. Not long after this disaster, Yaweh’s flood caught up to them. All the remaining women were drowned, except for the warrior woman Banba, who ran up into the hills to survive. In his cave, Fintan had a strange dream: he dreamed that he was a salmon, and when he awoke he was a salmon, swimming through the floodwaters and surviving. With the wisdom he learned, and his trick of shapeshifting, Fintan was able to live for five thousand years in Ireland, as salmon, hawk, deer and boar, occasionally becoming a man to share his wisdom with new people who came to Ireland.